"This dish will liven up any meal! Preparation time: 5 minutes. This recipe is from The WEBB Cooks, articles and recipes by Robyn Webb, courtesy of the American Diabetes Association." Preheat oven to 400 degrees F (200 degrees C). Tear a large sheet of aluminum foil. 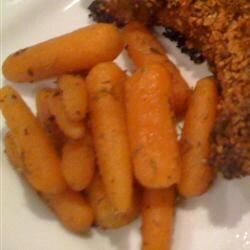 Place carrots on foil and sprinkle with walnut oil, cognac, honey, and cinnamon. Wrap up tightly and roast for 25 to 35 minutes until carrots are tender, yet crisp. See how to make the perfect special occasion side dish. Good recipe. Very easy to prepare. I also cooked them for around 50 minutes. I added some walnuts before I cooked them also. I will definetly make these again. Excellent and easy recipe. Unlike other reviewers, mine were perfect in 35 minutes. Both hubby and guests really liked them. Definitely a keeper recipe! These were amazing carrots! I decided to tweak them just a little bit, but they were delicious! Very good and very easy. Bagged baby carrots worked great. My young kids (who have an off and on relationship with carrots) loved it. Will do again!